Ghostwood was designed to: (i) be comfortable, (ii) require little maintenance, (iii) be reasonably affordable, and (iv) have a small environmental impact. We bought the land in March 1995, started construction in May 1996, completed the building envelope in October 1996, and moved in in October 2001. 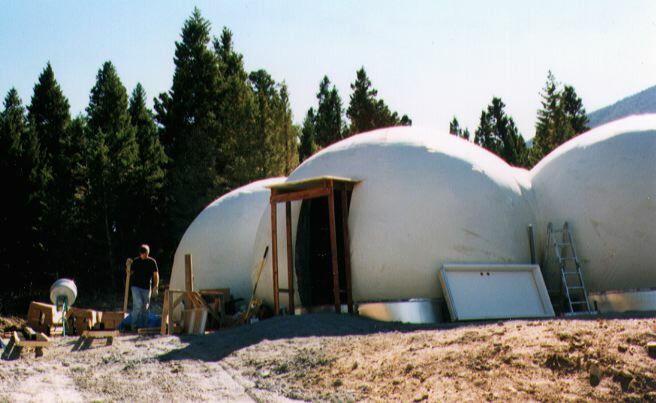 I did all the design work and subcontracted the initial excavation, the foam insulation, the concrete flatwork, and the shotcrete. Kaite and I did everything else, mostly on weekends. There are plenty of details left to work on, but the house is comfortable and the systems work well. Building Ghostwood was hard - harder than I thought it would be. I under-estimated the time and cost of nearly everthing. But designing and building it has been the most challenging and rewarding thing I have ever done. I'm very glad I did it.